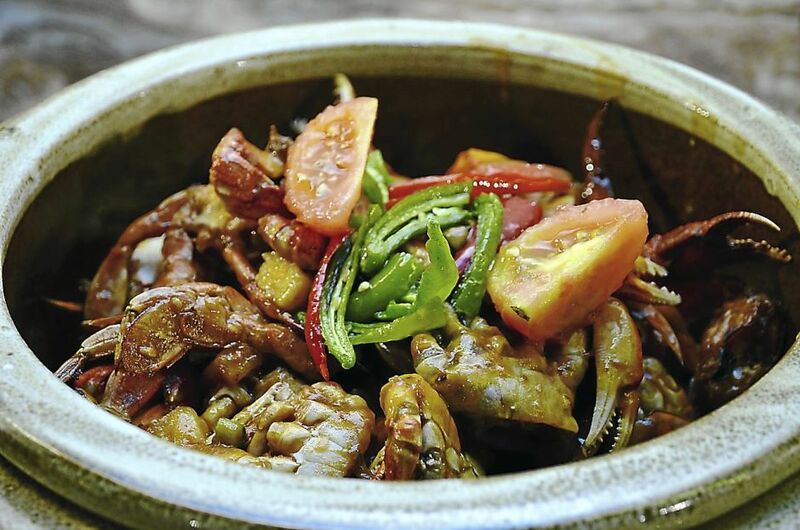 THE year-old Retro Cafe at the new four-star Vivatel Kuala Lumpur, Jalan Loke Yew, aims to please Ramadan diners to its Masakan Kampung buffet promotion. According to executive sous chef Mohd Delie Omar, the balik kampung style buffet will consist of over 70 dishes, ranging from appetisers and kerabu, bubur lambuk to several kampung-style dishes that many diners are familiar with. The appetisers and kerabu alone come up to 30 varieties, with offerings such as prawn and mussel kerabu, the spicier kerabu nangka (young jackfruit) and acar jelatah, with generous amounts of pineapple. The bubur lambuk was a little bland, although kitchen staff had taken care not to let it overcook and char the bottom. Nonetheless, a few more ingredients would be quite a welcome. As for the main buffet dishes, variety is not a problem. There are several kampung-style mainstays to choose from, such as Ketam Lemak Manis, with rich, sweet yet spicy gravy. Others include Kambing Hitam Manis, consisting of mutton overlaid with sweet black sauce and grilled, and simple catfish cooked in rich coconut curry. No kampung-style buffet would be complete without Daging Gulai Kawah Berkentang. Mohd Delie had utilised beef lung for the media preview. It is an unusual choice but much welcomed as the stew is rich and aromatic. For the preview, there was only one action station in operation. It was serving roti canai. However, Mohd Delie has promised that the full iftar (breaking of fast) menu will have other stations serving curry laksa and mee hailam. It is not just kampung dishes on selection. Given Mohd Delie?s background in Japanese cuisine, it is no surprise that there is one section devoted to sushi and maki rolls while another section has Chinese-style chicken rice and yong tau foo. For those with a penchant for Western food, there are a few dishes, mainly pasta, included. On the dessert side, there is an array of bite-sized cakes ranging from brownies, carrot cake to fruit and walnut slices topped with cream cheese. Local desserts are not left out either, with pineapple tarts and traditional kuih bangkit for diners to try. There will also be a dessert action station operating during the Ramadan promotion as well. The buffet runs from July 16 till Aug 4, starting from 6pm till 10.30pm. It is priced at RM70++ per adult while children below 12 years old and senior citizens above 55 are entitled to a special rate of RM40++.